The U.S. Coast Guard said Friday it is responding to a second oil-rig accident. A “mobile inland drilling unit” with a 20,000-gallon diesel fuel capacity overturned in the Charenton navigational channel south of U.S. Highway 90 near Morgan City, La. No fuel leak or injuries have been reported but 500 feet of containment boom has been deployed around the rig, the Coast Guard said. The unfolding disaster is an effort to shut down oil drilling in the Gulf of Mexico. On Friday, radio talk show host and former Reagan cabinet advisor Mark Levin accused the Obama administration of a plot to nationalize the oil industry. “I think those SWAT teams are there in coordination with the attorney general’s office, the Interior Department, Homeland Security, maybe the EPA….to seize records at these sites and to lay the foundation for more government takeover,” said Levin. Obama said on Thursday he was dispatching SWAT teams to inspect oil rigs in the Gulf, a response that struck many observers as odd. This is a public relations stunt designed to make Americans think the federal government is responding to the disaster. In fact, the government has no intention of doing anything significant. Obama’s response if purely cosmetic and for public consumption. Levin and many Republicans think Obama is a Marxist and wants a Soviet-like centralized economy. Obama, however, is not surrounded by textbook Marxists who want a revolution in the name of the proles. He is surrounded by bankers and monopoly men. The Obama administration is a creature of the CFR, Trilateral Commission, the Federal Reserve, and Wall Street banks, not the Comintern. Oil rigs are being attacked in order to shut down oil production, not nationalize it. The name of the game is artificial scarcity designed to further cripple the economy. On Friday, Obama promised that no new offshore oil drilling leases will be issued unless rigs have new safeguards to prevent a repeat of the explosion that unleashed the massive spill threatening the Gulf Coast, according to the Associated Press. The number of structures in the Gulf is roughly 4,000, with 819 manned platforms. How long do you think it will take an ossified federal government to install these safeguards? As Lindsey Williams has noted, the global elite are manipulating oil in order to create a world-wide economic depression. “America will see a financial collapse so great that it will take years to come out of it,” Williams told Alex Jones on November 21, 2008. More offshore platforms will likely be shut down in the days ahead. Meanwhile, members of Congress are calling for expanded oil exploration plans to be dropped. “I’ve said to the White House, ‘Don’t you dare think about your five-year plans [for offshore oil leases] … We’re just not going to let you,'” said Florida Sen. Bill Nelson on Friday. “Nelson said the state’s multibillion-dollar tourist industry and fisheries shouldn’t be imperiled for oil’s sake. He said the spill may ultimately serve as a lesson that the country needs to develop cleaner energy sources,” reports The Florida Times-Union. As if on cue, the Soros foundation MoveOn has called on its members to telephone the White House and demand that Obama reinstate the ban on offshore oil drilling. “The MoveOn campaign is just one of a series of pleas from lawmakers and environmental groups for the administration to reverse its policy in the wake of the explosion and spill,” reports The Washington Post. 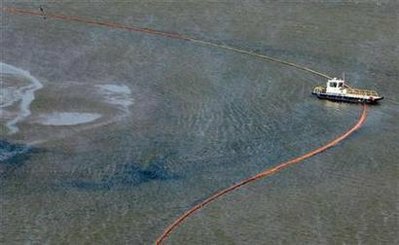 The explosion and massive oil spill will be used to make sure artificial oil scarcity continues. The ultimate goal is not clean energy or so-called energy independence but delivering the once great United States into the maw of the bankers who are determined to consolidate power and convert the world into a sprawling high-tech prison planet.